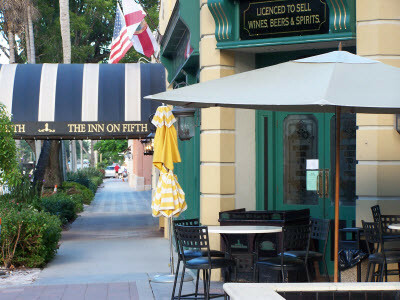 Olde Naples (it can be spelled "Olde" or "Old") is where the city of Naples, Florida was born. It is the epicenter of Neapolitan life on the Gulf of Mexico. Old Naples is located downtown, west of US-41 on the Gulf of Mexico. Some of the best beaches in the world are located here. Major streets downtown include 5th Ave South and Third Street South. The local zip code in Old Naples is 34102. Olde Naples is often loosely defined but primarily includes all real estate from Golf Drive (at the north end) down to 14th Ave South that is west of US 41 or the Tamiami Trail. It also encompasses the property south of 41 (as it turns west to Miami) and west of the Gordon River where Tin City and the Riverwalk restaurant are located. Note that the communities South of 14th Ave South are not officially part of Olde Naples. The luxury home communities of Aqualane Shores and Port Royal were man-made land masses built later and thus not "old" by Naples standards. This charming Gulf Coast city is beyond compare. Neapolitan architecture is at the heart of the casual yet sophisticated lifestyle. A walk down the coconut palm lined streets of 3rd Street South or 5th Avenue South will give you a taste of the Naples way of life. Boutique shopping, art galleries and sidewalk cafés abound. On 3rd Street South try Tommy Bahamas for some live music on Saturday afternoon. It's like being on a tropical island in the midst of downtown Naples. Enjoy a rum runner (or two!) while dining outdoors to the beat of some Jimmy Buffet and a little Reggae. One of the main draws to Olde Naples, by real estate buyers and tourists alike, is the proximity to the gorgeous white sand beaches Naples is famous for. Almost every avenue, from Golf Drive to 14th Avenue ends at the beachfront. Each avenue is unique and has public parking and exclusive beach parking (free for local residents). Some avenues have park benches (note the plaques with names of the donors) are favorite spots for locals to watch the amazing sunsets we all love. Although staying in a hotel on the beach makes a great vacation, resting your head in one of the more intimate Olde Naples hotels can give you a better sense of what being a true Neapolitan is all about.